NAGA CITY 12/22/16 (Bicol Standard) -- Catanduanes Gov. 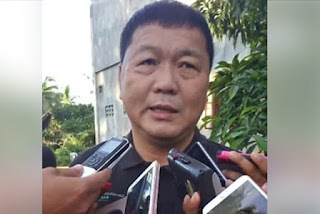 Joseph Cua has condemned the killing of Virac businessman-politician Larry "Uktoy" Que. “As Chief Executive of the Provincial Government of Catanduanes and Chairperson of the Provincial Peace and Order Council, most importantly, as an individual with moral ascendancy over another, I strongly condemn this recent act of atrocity perpetrated by unknown assailant/s against Mr. Larry Que—a fellow Catandunganon," his statement reads. "For so long, even during election period, Catanduanes has been among the few provinces in the country where killings—politically-motivated or otherwise—have been unheard of. We have always taken pride in our island province’s penchant for peace and forbearance that our province’s crime incidence has been marginally confined to petty crimes and occasional crimes of passion, but never of those committed in cold-blood. It therefore greatly saddens me now that violence has found its way into our community. We should not let this happen. I believe in the sanctity of life and in keeping our community safe. I join Mr. Que’s family in prayer that his condition may improve and those who are truly responsible for this horrendous crime shall soon be apprehended to face the full force of the law. Although it is common knowledge that Mr. Que and I have had previous differences in opinion on matters concerning public leadership, I have always welcomed and respected his views. I strongly encourage everyone to remain vigilant and I urge our local police force to exhaust all means for the immediate resolution of this case,” Cua continued. On December 19, Governor Cua requested PSSUPT. Jeffrey S. Fernandez of the Catanduanes Police Provincial Office in a memorandum coming from the Office of the Governor and Chairman of the Provincial Peace and Order Council (PPOC) to be furnished with an official daily investigation report on the discovered shabu laboratory in Palta Small, Virac and the shooting incident causing the sudden death of Larry Que. The PPOC Chairman seeks to be guided by the daily investigation reports in the necessary actions that the council has to take to help in the speedy resolution of the two significant peace and order concerns.